Now that you’ve got your products out there on social media in all their holiday glory, it’s time to have a little fun with the help of your customers. 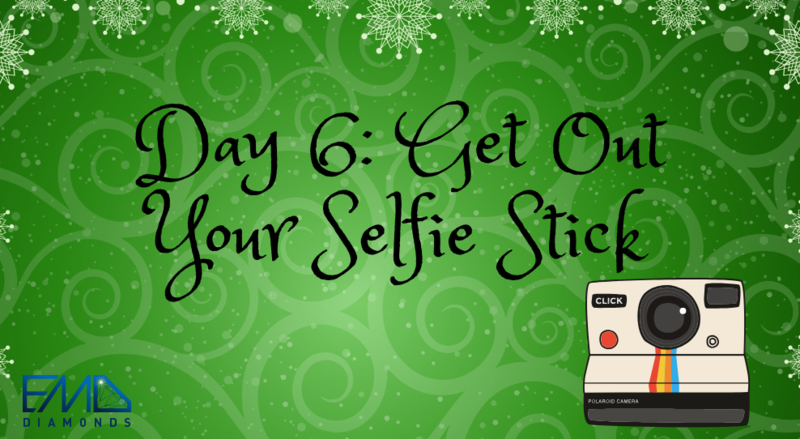 Get out your selfie stick, because it’s time for a holiday selfie contest! On the 6th day of Christmas my true love gave to me…. Selfies With My Products. There’s nothing like a good holiday selfie to spread some holiday cheer, so why not incorporate this overcooked practice and gain some new followers at the same time. Challenge your customers to take selfies with your merchandise. This not only gets more people in your door, but it creates a snowball effect and will get you more attention and followers on social media. Set up a display in your store, explaining what your holiday selfie contest is to your customers and potential customers. Take your own selfie (or have an employee do it) with a piece of your jewelry and use it as an example for everyone to see. Don’t forget to include your hashtag and your store’s social media info so people can tag you as well. If you really want to go the extra mile, your display can include holiday props for the pics. Spread the word about your contest. Post what you are doing on your social media platforms, and get your followers into your store. Choose a prize. A good contest has to have a prize - this is what gets people to actually participate. The selfie with the most likes/comments at the end of the contest is the winner. Get the snowball rolling. In the first few days of the contest, you might need to bring in some of your friends/family to gather momentum. Once the snowball starts rolling, customers will get on board. Post the results. Once the contest is finished and a winner is selected, post the winning selfie pic on your social media channels. You can also post other photos as well, to show how well it was received. When all is said and done, you'll gather the excitement your fans have for the holidays and your brand together, creating a festive and fun image.